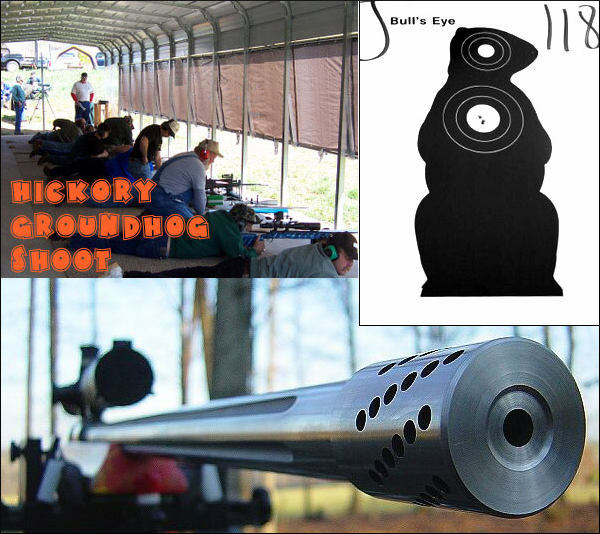 This past Saturday, April 2nd, the Hickory Groundhog Shoot was held in Vale, North Carolina. One of the nation’s most popular varmint competitions, the Hickory Shoot offers a host of valuable prizes. Here’s a report from Jonathan Trivette, who attended the Hickory Shoot for the first time this year. The Bullseye Groundhog Shoot, aka The Hickory Shoot, is one of the most unique groundhog shoots that I have ever attended. This event, held the first Saturday of April every year, is very well-organized — it runs like clockwork. This year was my first time attending this Shoot and I was impressed. There were 215 shooters and the match was over by 1:00 pm. After the main match they sell chances to shoot at an egg at 500 yards. Shooters that hit the egg receive a cash award and get their name on the Egg Hall of Fame Perpetual Trophy. The shoot starts at 8:00 am and you are allowed to sign up the day prior and that morning until the match starts. The range is open the week prior to the match for practice so you can get familiar with the venue. The match has two classes: Custom (Open) and Factory. Entry fee is $25.00 per gun. The Custom Class permits any gun and caliber you would like to use and you can use most any type of rest. Some of the Custom Class guns can weigh 40 pounds or more. The Factory Class is limited to factory guns, and the only rest(s) you are allowed are bi-pods and sandbags. This year Clifton Odell won the Custom Class with a 95 score while Kevin Philbeck won the Factory Class with a 75 Score. The Hickory Groundhog and Egg Shoot is the richest varmint shoot East of the Mississippi. The 36th annual Hickory Shoot was held this past weekend. The event is hosted the first Saturday of April each year by Larry Willis of Bull’s Eye Sporting Goods, (704) 462-1948. In years past over $7,000 worth of prizes and cash has been awarded. The normal course of fire consists of three sets of paper groundhog targets at 100, 300, and 500 yards, and NO Sighters. Shooters can also compete in an Egg Shoot for cash and other prizes. The basic entry fee is just $25.00 per gun. That’s cheap for a chance to win a bundle of cash, plus valuable prizes such as Shehane stocks and Nightforce optics. The course of fire is three (3) shots at the groundhog target from the prone position at three different distances, 100, 300, and 500 yards. They do have a bench for handicapped shooters that can not get down in the prone position. Most competitors will shoot at the head at 100 yards because the points are higher. The other two distances that are normally shot are 300 yards and 500 yards. The shoot is run very smoothly with one relay shooting while the next relay waits outside the shooting area, ready to go. Once a relay is done, shooters grab their items and exit on one end of the shooting platform while the next relay comes in from the other end. You must quickly set up and get ready because as soon as the target pullers get back they are ready to shoot. When the fire command is given you have two minutes to get your three shots off at that distance. When the cease fire is called you quickly grab your gear and get off the shooting platform because the next relay is coming in. At the prize ceremony Larry Willis presents the awards to the top shooters. He also acknowledges the Junior Shooters and even gives out prizes for best-looking male and female shooter and who drove the farthest. I had a chance to speak with Larry after everything was over on Saturday and you could tell that he really enjoys being able to put on this event for his fellow shooters. So whether you are looking to kick off your groundhog season or your summer shooting season, if you find yourself looking for something to do the first Saturday of April next year, make the trip to Vale, North Carolina for the annual Groundhog Shoot. The range is located at 8216 Will Hudson Road, Lawndale NC 28090. CLICK HERE for 2016 Bullseye Hickory Groundhog Shoot Complete Match Results. Share the post "Hickory Groundhog Shoot — Report from North Carolina"